Origin and Habitat: Escobaria cubensis was discovered in the dry hills to the west of the city of Holguin, in the northern part of Cuba, at the beginning of the 20th century. 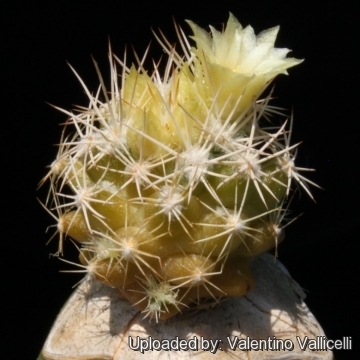 It was found by N. L. Britton, when he and his wife were on their way to the Camaguey Plains, and described by Britton and his partner Rose in 1912 as Coryphantha cubensis. Since then the plant has been considered, at one time or another, as a Neobesseya, Neolloydia and an Escobaria. It is found at four locations and occurs at elevations up to 280 metres above sea level. The extent of occurrence is estimated to be around 900 km2. Plant density is small, about 35 plants/km2 . The population in Cerro de Galano is approximately 100 individuals. Habitat and ecology: This plant grows in microhabitats of bare stony ground in thorny thicket on serpentine outcrop with 1-4 m tall evergreen shrubs, rare scattered trees and some grass (Frimbristylis dichotoma) which is more abundant where there are no cactus colonies. This is one of the richest plant communities of the Caribbean and the endemism on some of these areas reach 80-85 %. 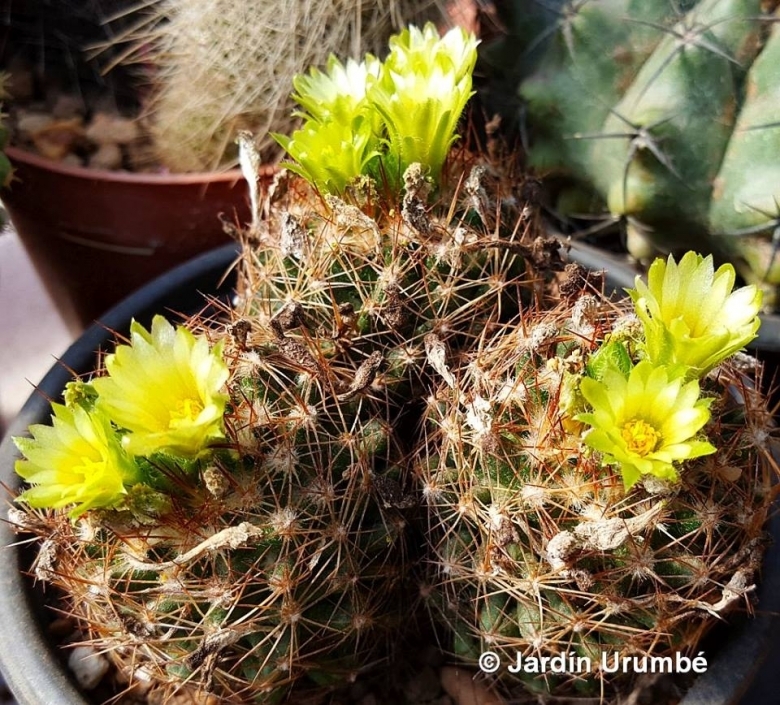 In this areas there are many succulent plants like Agave sp., Furcrarea hexapetala and cacti (Melocactus sp. and Pilosocereus sp.). Plants mimics the the background and are almost invisible. The soil is characterised by the presence of many rock. It is a ferritic soil with a high manganese content, much eroded on the surface. The rocks near the plants are bluish-green with white spots. They usually form small and clustered populations at the base of older specimen, because the young seedlings need the protection of a mother plant that ensures some shade and protection. Ants have been observed inside the flowers, and it is possible that they act as pollination agents. They can escape damage from fire to some degree because in the dry season they are at ground level or even below. This Cuban endemic is threatened by habitat loss and a reduction in habitat quality due to the development of forestry plantations and the invasion by the exotic shrub Bell Mimosa (Dichrostachys cinerea). It is also affected by charcoal production, road construction, and waste disposal. 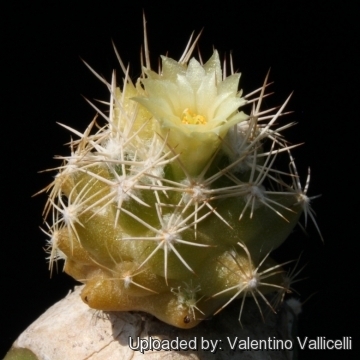 Description: Escobaria cubensis is a dwarf species with very small flowers, it is one of the rarest cacti and it is seldom seen in specialized collection (it is virtually unknown out of it natural habitat). The plants do not reach more than 20 mm above the surface, and in habitat they are camouflaged by rock fragments. The greenish-yellow flowers, about 16 mm in diameter, are produced from the axils near the apex of the body, but are not very showy. Stem: Very small, solitary, globose to depressed globose, not more than 2,5 cm tall and 4,5 cm in diameter (but usually in habitat the plant are half this size or even lesser) pale green, yellowish-green to olive green. Roots: The root of the plant is very well developed. A specimen has been found with a main root 6.8 cm in diameter and secondary roots 3.4 cm and 2.5 cm in diameter, firmly attached to rocks. The root system is able to break small pieces of rock. ln drought periods the roots contract and the whole plant seems to disappear beneath the surface of the ground. With the spring showers it soon emerges with renewed vigour. Tubercles: Narrow 6-7 mm long, grooved only half the length along the ventral surface. Radial spines: 10-15, finely hairy, radiating, white, (2-)3-4(-6) mm long. Roots: It has a strong fat taproot up to 7 cm long. Flowers: Yellowish-green at the plant apex not more than 11 mm tall and in diameter. Blooming season: The flowers open in the daytime and in the habitat have been observed to be open between 10 a.m. and 2 p.m., repeating this process over a period of four or five consecutive days. 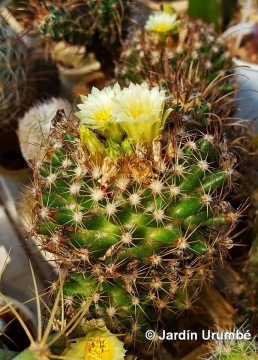 The plant never flowers during the period between June and August. Fruits: Roundish to clavate less than 1,5 cm long. Immature fruits are greenish-yellow and become pink to red at maturity and can contain up to 35 small black seeds. 6) Reyes-Fornet, A., Fornet, E. and Cables, F. 2010. “Experiences in the management of the Forestry Farm contribute to the conservation of Escobaria cubensis (Cactaceae).” Bissea 4(2): 1. 7) Reyes-Fornet, A., Fornet, E. and Fernández, A. 2008. 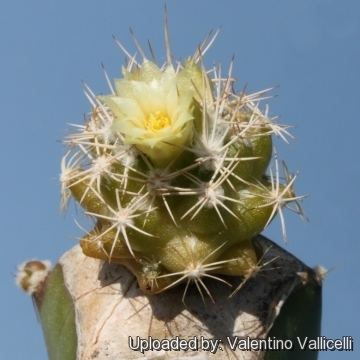 “Conservation of Escobaria cubensis (Cactaceae)” in Holguin. Bissea 2(4): 2. 8) Taylor, N.P., Barrios, D. & González Torres, L.R. 2013. Escobaria cubensis. The IUCN Red List of Threatened Species 2013: e.T152653A661995. http://dx.doi.org/10.2305/IUCN.UK.2013-1.RLTS.T152653A661995.en. Downloaded on 17 August 2016. Cultivation and Propagation: It is not easy at all to cultivate as it need hight temperatures, full sun and a very porous draining substrate.